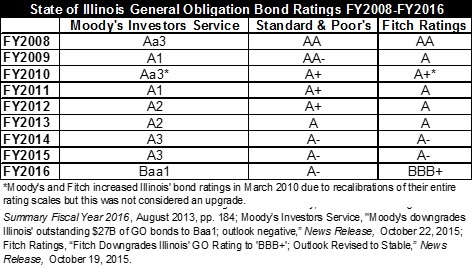 As previously discussed here, due to the FY2016 budget impasse, two of the three major rating agencies reduced the State of Illinois’ bond ratings in October 2015. These downgrades made Illinois the only state credit currently rated below the ‘A’ category and signals a weakened capacity for the government to meet its financial obligations. 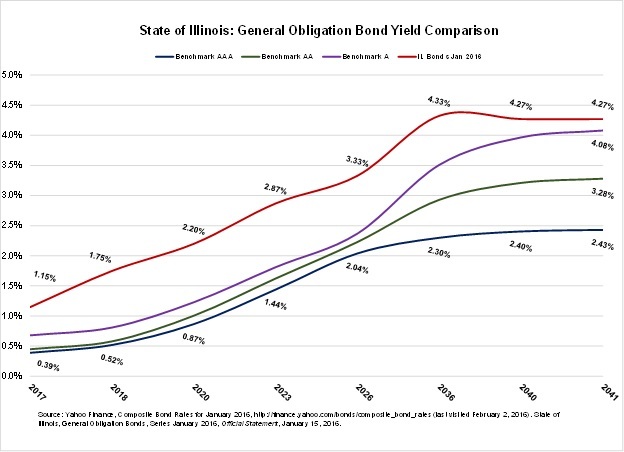 Although the rating is now below the ‘A’ level, Illinois’ General Obligation bonds are still considered investment grade and three levels above the speculative level, or junk status. The following table shows the State of Illinois’ General Obligation debt rating at the end of each fiscal year from FY2008 through the current ratings in FY2016. Lower bond ratings increase the State’s cost of borrowing above other better-rated governments and can delay important infrastructure funding for the State. Illinois had not issued General Obligation bonds since April 2014. Although the Governor’s proposed FY2016 budget projected a sale of $250 million of capital purpose bonds in FY2015 and proposed the sale of an additional $1.1 billion in bonds in FY2016, the State remained out of the municipal securities market until early in 2016. Prior to the downgrade, Illinois stood alone with New Jersey as the only single ‘A’ rated state credits. More than half of the remaining states, including the formerly ‘A’ rated California, are rated ‘Aa,’ and 15 states have the highest level of ‘Aaa’ rating from Moody’s. On January 16, 2016 the State sold $480 million of General Obligation bonds to fund ongoing capital projects. The following chart compares the yields received by the State to the benchmark yields for better rated municipal credits reported for the month of January. Yields represent the interest rates on bonds after accounting for any premiums or discounts paid or received by investors at the time of a bond sale. Various market factors may affect the yields that investors are willing to pay for new bonds at any given time, including but not limited to the bond ratings of an issuer. Internal analysis by investors, market supply, demand for various yields at specific maturities and other portfolio standards can affect the outcome of a bond sale. However, based on the available data, Illinois paid much more than it would have been charged prior to the downgrades for the $480 million of bonds issued in January, which will cost a total of $238.3 million in interest through FY2041. For the same bond issuance, a government with an ‘A’ bond rating receiving the composite yields in the chart above would have paid 18.0% less than Illinois, leading to a total of $43 million in interest savings. 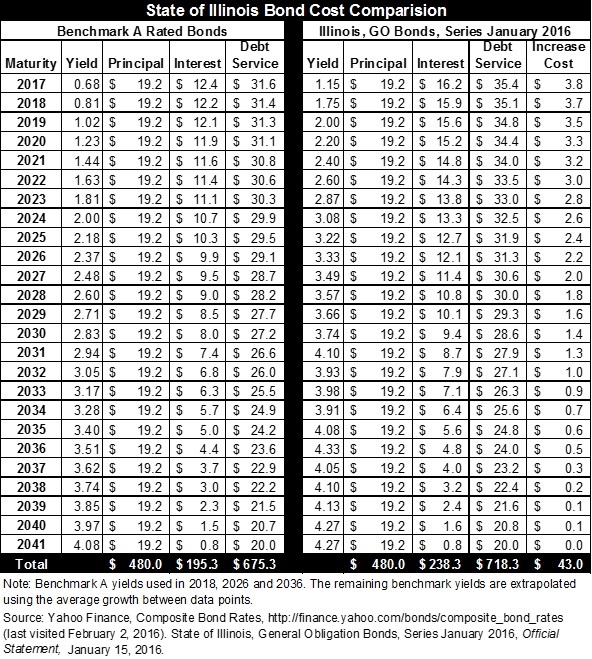 The following table shows the calculation of the increased borrowing costs for the State of Illinois compared to the composite bond yield data available for single ‘A’ rated bonds in the month of January 2016. Using the same methodology, a government rated ‘AA’ would have paid $72.8 million less, or 30.5%, and a government rated ‘AAA’ would have paid $105.0 million less, or 44.1%, for the same bond issuance. Although these additional interest charges are paid over 25 years, the higher yields lead to a significantly greater cost to provide essential infrastructure investments for the State of Illinois due to its low credit ratings and ongoing budget crisis.